We leverage our flexible technology platform to ensure that every client receives a custom tailored solution. defenderData™ is highly customizable; we want your system to work the way you want it to work. In order to handle security for the application interface itself, groups are created that represent typical individual roles within the office. defenderData™ is a full featured case management system designed to handle high volume caseloads as commonly found in public defender offices across the Country. Scheduled hearings/appointments logged under the case file are immediately populated in the respective calendars of the attorneys and staff working on the case, as is appropriate. Ready to see how Justice Works can “Work” for you? Still paying vouchers by hand? Tired of paper piling up on your desk? Looking forward to year-end reporting? Submitting vouchers electronically is exceptionally simple from defenderData™ Web. 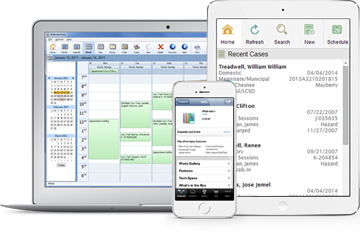 dD Mobile provides access to critical case information, notes, calendar, and even documents. Make changes to your time-sheet, schedule, and case notes from anywhere. You can even take pictures with your phone and attach them to the case file! No need to carry a briefcase full of documents to court or client meetings. 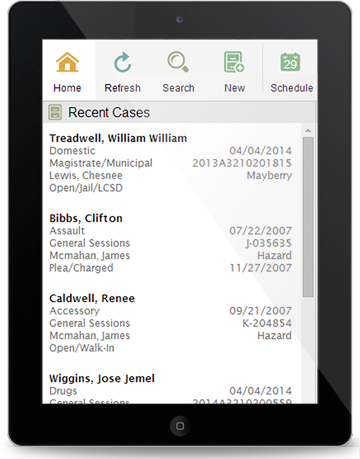 An internet connected tablet is all you need to access police reports, motions, pleadings, etc.